So imagine the excitement I felt while reading one of my favorite geeky plant lover books, Paradise Lot by Eric Toensmeier, (which is a great read, by the way), I discovered that custard grows on trees! That’s right. Custard grows on trees, people! You can imagine how stinking excited I was about this! O.M.G.! I had to look into this. If custard grows on trees, then I most definitely need this tree! That was 3 years ago. Since then, I’ve been on a semi-serious hunt for Pawpaw trees. The first year I started looking I found them online, but too late. Sold out. Everywhere. Obviously others have heard about custard growing on trees too and felt compelled to have one of their own. I couldn’t blame them. They beat me to the punch. Okay, try again next year. It’s a spring morning in 2015. I’m sitting at my dining room table, sipping coffee, flipping through the Friends School Plant Sale catalog, which had come in the mail weeks ago but I’d just taken the time to sit down and look through. The Friends School Plant Sale is one of the largest in our area, so large they need to hold it in the Grand Stand at the Minnesota State Fair grounds. This is one that people flock to, arrive early to get wristbands and then come back a couple hours later to enter. They have over 2,500 varieties of plants, which requires a large catalog. They have it in an electronic form, but I still get mine mailed to me because there is something wonderful about flipping through, circling, highlighting and dreaming of the possibilities to come. The catalog comes in the form of a small, thick newspaper full of plants, descriptions and prices. I look from section to section… Actually, no I don’t. I cut to the chase. I go straight for the Fruit section, followed by the Unusual & Rare Plants section, then Vegetables and finally Herbs. I’m all about edibles, folks. It was while I was breezing through the Fruit section that I nearly choked on my coffee and spit it out. There it was… Pawpaw! No way! Here. In Minnesota. At the plant sale. One small problem. I wasn’t going to be able to make the sale because it would be just too much to tote a 5 month old baby to… but, one of my dear friends goes every year, so hope wasn’t lost. I asked her to pick one up for me. She agreed without hesitation. Yes! The plant sale day came and I got a text… “No Pawpaws. Crop failure.” Bummer. May 2016, an afternoon days before the Friends School Plant Sale begins, I spread the newspaper- style catalog on my kitchen island in hopes of being able to catch a glimpse between, “Up?”, “Milk?” and games with my sweet toddler. She eats. I have a second. I flip to the Fruit section and scan the page. There it is. Pawpaw. Custard on a stick, so to speak. I wrack my brain trying to figure out how I could get to the sale on the first day to have a chance at getting them (assuming no crop failure again). The reality is that it wouldn’t be ideal, or very feasible to wait for 2 hours to get in and haul a toddler through the sale. No Pawpaws this year. But wait! I got a text, “Need anything rare or unusual at the sale?” Ahhhhh!!! Yes! My friend is a doll. I ask her to pick-up 2 Pawpaw trees if they have them and if she has room. They had them. She got them! 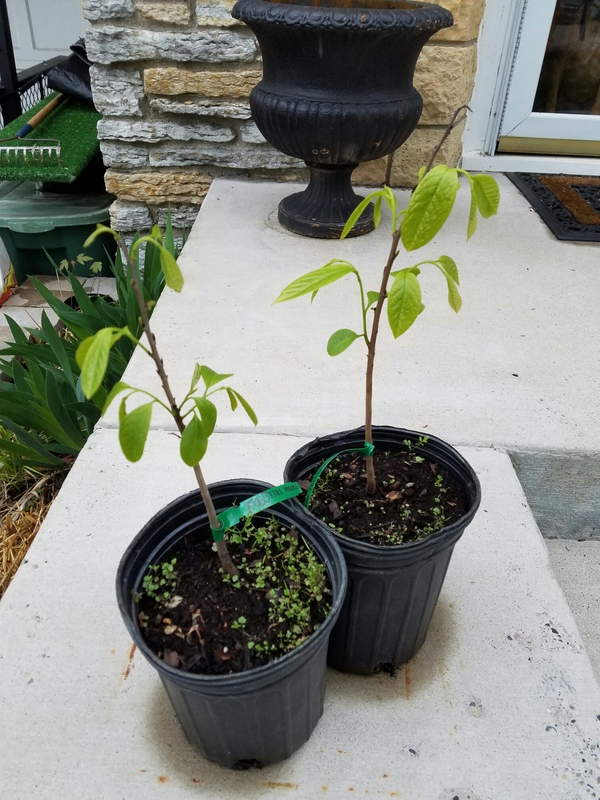 I am now the proud owner of two Pawpaw trees!!! They are little guys. I’m not sure they will survive our winters. I’m trying to research how far North they have been successfully grown. They are a Zone 5 – Zone 8 plant. I’ve managed to push the envelope before, so maybe I can make this happen too! Imna little gun shy though, it took me 3 years to get these guys so i dont want to lose them during their first winter so I might pot them up in a large pot now and bring them inside for the winter. We’ll see. For now I’m just excited to have my very own custard on a stick… in 4 – 8 years. Cheers to all of your gardening dreams! Have you ever taken an unplanned vacation? Just dropped everything and took off? Me neither. That’s what it feels like having left this blog behind though. Maybe vacation is the wrong word for it. Life got a little crazy. Amazing how a new little one can cause a hiccup in how things operate, isn’t it? And while I usually mean baby chicks, cats, dogs or the like, this time I mean a little person. So what’s going on? How are you? What have you been up to? I’ve been contemplating or maybe finally starting to feel like I’m in a place where I can start writing again. At first I wasn’t sure what I would write about. It’s been a while, so I kind of forgot how to do this writing thing. But as all good things seem to come for me, it’s usually by getting a sign. In this case it was a meme on Facebook that basically said “write”. So I thought about it and realized that, yeah, maybe now is a good time to get back to writing. For the past 16 months I’ve been a full-time Mom to my baby girl and son (after he gets home from school). For a few months each spring I’ve also been teaching “Learn to Grow a Straw Bale Garden” classes in the Twin Cities metro and out state area at night. I’m wrapping up the teaching season now and simultaneously getting my own straw bale garden rolling for my 4th season, which I am very excited about! I love gardening and love growing food in straw bales even more. With very few exceptions there aren’t many things I haven’t tried growing in my straw bales and pretty much everything has been amazingly abundant! Another thing that has been abundant this year is rhubarb! It would probably be an understatement to say that I am a little obsessed about making things with rhubarb right now. My wonderful Mother baked a rhubarb pie for Mother’s Day and since then I’ve made Rhubarb Compote, rhubarb vanilla bean simple syrup and am trying my hand at Rhubodka with a twist: I added the rhubarb vanilla bean simple syrup with the rhubarb still in it (not strained yet), additional fresh rhubarb, a piece of vanilla bean and added a few strawberries. I haven’t played around with infusing alcohol before so I’m pretty excited about it! One thing I know about it already is that it’s really hard to just look at it, give it a little shake each day and not sample it. Today is day 2. I can’t imagine it’s going to get any easier as time goes by and I have to wait a month! 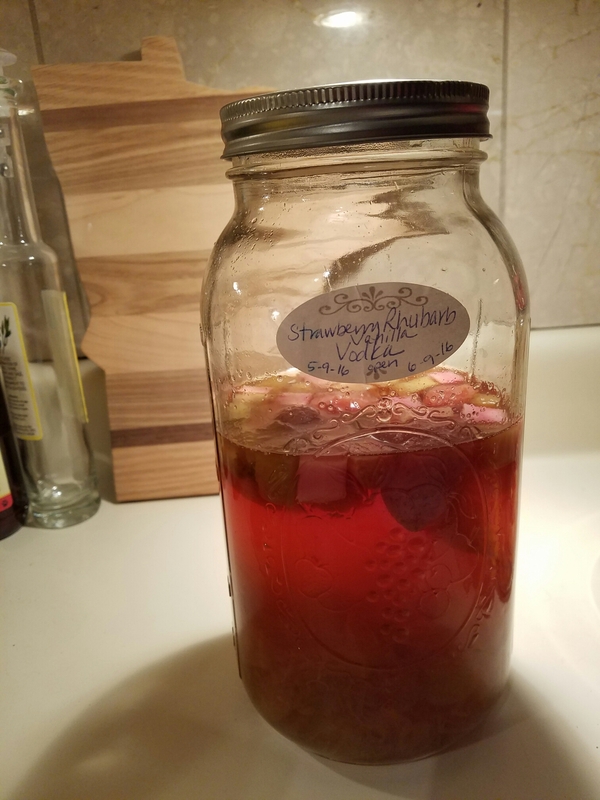 Over the past year or two I’ve had a lot of fun experimenting with preserving fruits and veggies. Freezing, canning, jams (tomato vanilla bean is to die for), sauces, simple syrups, you name it. I plan on playing with dehydrating this season too. My hope for this blog going forward is to share as many of my gardening/urban farming and food preservation experiments with you as I can. I’m excited to start writing again and hope you enjoy the adventures with me! See you in the garden… (or kitchen).